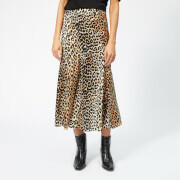 The Finders Keepers Women's Seen It All Maxi Skirt in grey boasts a soft cotton and polyester blend construction with an asymmetrical wrap around style. With a mid rise and fold over detail to the front, the centre split features above the knee for a flattering fit. K.D.